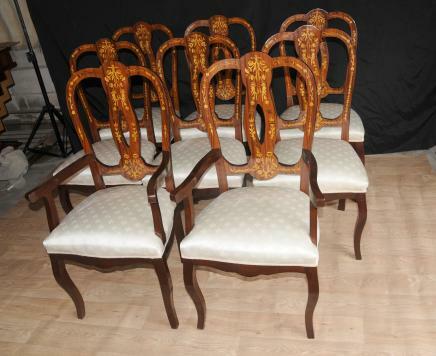 You are viewing an amazing set of 8 English Chippendale style dining chairs consisting of 8 side chairs and 2 arms. What can be said about the good old faithful Chippendale chair. It’s a design classic. The ultimate in dining accessory. Strong, sturdy, elegant, these are built to last and will serve you from here to eternity. This set has just been repolished and reupholstered so they are ready for home use right away. They come with calico seat covers – very comfortable. 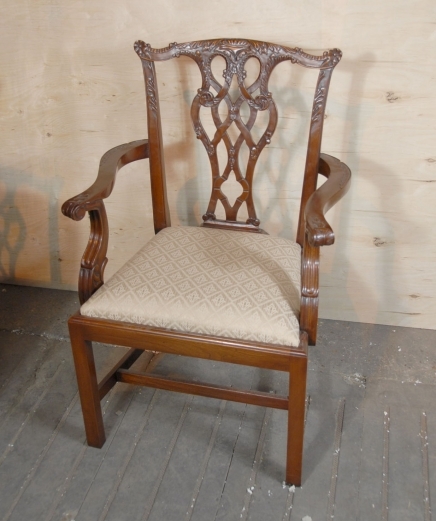 The grain to the mahogany is great and the chairs have a lovely finish. 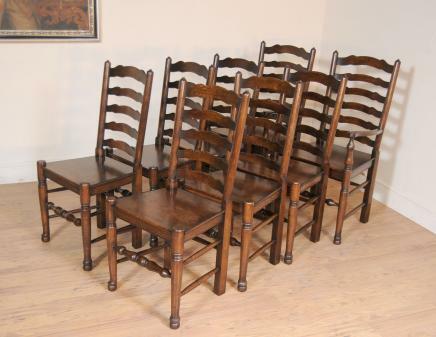 We have pictured these around a Victorian extending dining table we have available so please email us if you would like to buy a dining set and we can work out a great price. Chippendale, Thomas (1718-1779), English furniture designer and cabinetmaker whose name has become the generic label for furniture of the 1750s and 1760s. The son of a Yorkshire joiner, he probably served a family apprenticeship before seeking his fortune in London. He established a workshop there around 1749, later moving to spacious premises in St Martin’s Lane, at the hub of the London furniture trade. His partner, James Rannie, probably financed the business. In 1754 Chippendale published The Gentleman and Cabinet Maker’s Director by subscription. This was a book of engraved designs for a wide variety of household furniture in the fashionable styles of the time, including the Rococo, Chinese, and Gothic tastes. It was reissued in 1755 and, with additions in the newly emerging Neo-Classical style, between 1759 and 1762. The Director established Chippendale’s reputation as a leading cabinetmaker and ensured his lasting influence. It was the most distinguished of all the 18th-century furniture design books and the first to provide a comprehensive survey of the styles in vogue. Chippendale’s considerable business (he employed about 50 skilled craftsmen) was not without setbacks: in 1755 the cabinet shop was severely damaged by fire, and the death of Rannie in 1766 led to financial problems. Although relatively little is known of Chippendale’s private life and although he never achieved the gentlemanly status of some of his contemporary cabinetmakers, his firm produced a quantity of fine furniture for noble and wealthy patrons, and this is well documented. For some he both designed and provided complete interior schemes and it is known that he furnished interiors designed by Robert Adam. In addition, the firm supplied general household furnishings and equipment such as beds and bedding, mirrors, servants’ furniture, wallpapers, floor coverings, curtains and upholstery, chimney pieces and stoves, decorative metalwork and silverware; its services included repairs and removals, the hiring out of furniture, and funerals. Some of Chippendale’s most important furniture, ranging from early Director pieces to those executed in the Neo-Classical style of the late 1760s and 1770s, can still be seen in the houses for which it was commissioned. Notable examples are Dumfries House, Ayrshire; Wilton House, Wiltshire; Aske Hall, Nostell Priory, Harewood House, Newby Hall and Burton Constable in Yorkshire; Mersham le Hatch, Kent; Paxton House, Berwickshire; and Petworth House, Sussex. Chippendale’s eldest son, also Thomas (1749-1822), continued the business and maintained its reputation as one of the leading cabinetmakers of the late 18th century. 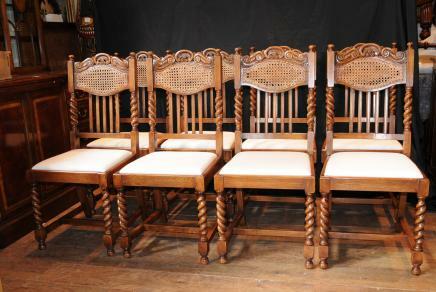 You are viewing a gorgeous set of 8 English Queen Anne dining chairs with some exquisite marquetry inlay work. I hope the photos do this stunning set some justice, they’re certainly more impressive in the flesh and would make a wonderful addition to any home interiors scheme. The set consists of two arm chairs and six side chairs. 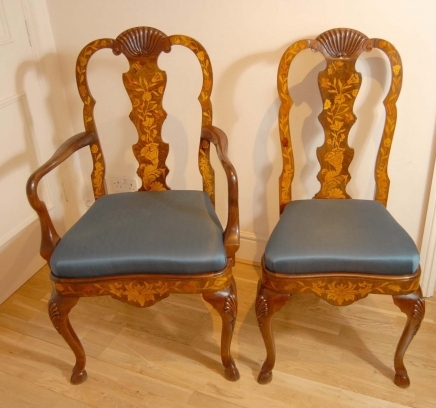 True to the Queen Anne style these have the shell topped backsplat and the cabriole legs with further shell motifs to the top. The marquetry inlay work is exquisite and is on all surfaces with leaf and flower designs. If you imagine how each shape is hand cut from the softer fruitwoods and them embedded into the walnut of the main structure. It’s a very time consuming and skilled process. The seats are covered in a blue fabric and these have just been reupholstered so are free from any previous owners smells such as pets and smoke, always a bonus. The chairs are solid and stable, no wobbles to the joints and ready for home use right away. We will ship to anywhere in the world. These were hand crafted here in olde England and we bought them from a dealer in Debenham Suffolk. The quality is outstanding. We have pictured these around a dining table to match that is also available so please email if you are interested in a dining set.